If you do a lot of baking or homemade cooking, you will use a lot of extracts. Your needs can range from homemade cookies, french toasts, homemade coffee creamers and so on. Buying commercial extracts is usually okay, but you take the chance with it being full of corn syrup and artificial flavor. Why spend the money when you can make it at home yourself? They are great hostess or holiday gifts as well. In this article, you will find recipes for making vanilla extract, mint extract, almond extract and lemon extract, with and without alcohol. I like to save my homemade extracts in these swing top bottles (affiliate link) for storage and when gifting. It just adds that homesteady flair to me. But, in reality, you can just use plain old mason jars to make and store your extracts in. Here’s how to make homemade, natural extracts for baking and more. But, what if you don’t want to use alcohol? Infusing sugar with the flavor enhancers is a great way for how to make extracts without alcohol. You can get the recipe for vanilla sugar here, and mint sugar here. You can also make homemade extracts without alcohol by using 3 parts glycerine and 1 part water in place of the alcohol in any recipe. Glycerine will give a more syrupy texture but is gluten free and alcohol free. The alcohol will extract the flavor FASTER than the glycerine, but the resulting flavor will be the same in a recipe. Read about the difference between tinctures or glycerites here. I like to slice the vanilla beans down the middle, place in the jar and cover with the alcohol. Then, every couple of days, give it a good shake. Continue to do this for about 6 weeks, then your vanilla will be ready to use. You can either strain off all the extract and rebottle as gifts or for yourself, or I just use the extract with the beans in it. As I need to, I continue to fill the jar back up with alcohol. After about 5-6 refills, I will replace the beans entirely. For the flavor of homemade vanilla extract without alcohol or glycerin, get the recipe for vanilla sugar here. Simply grab some mint leaves early in the morning. I have found the best flavor comes from leaves picked at this time. Rinse and dry off with a towel. Remove the leaves from any stems and stuff into the quart jar. Cover with the alcohol and allow to sit in a cool, dry place for 3-4 weeks. Strain the extract and compost the leaves. Get the recipe for mint sugar here. Place the almonds in the jar, cover with the alcohol. Shake daily for 3 weeks, then strain the nuts out. This won’t be as strong as commercial extract, but I like the flavor myself. Since almond extract that is commercially made contains bitter almonds, and they contain a cyanide precursor, some argue that you shouldn’t make homemade almond extract. I am personally not worried about this, as the same nuts also contain cancer-fighting compounds. Try delicious homemade almond milk! Read the post here. Adding the sugar is important. Without it, citrus extracts can get very bitter. Zest your chosen fruit-lemon zest for lemon extract, orange for orange. Place in a pint jar with a tight-fitting lid and cover with the sugar and alcohol. Shake daily for 2-3 weeks, then strain. The shelf life of these extracts is fairly indefinite. Alcohol and glycerine are both acting as a preservative, and I have never heard of it ever going bad, but the flavor may fade after 6-12 months. 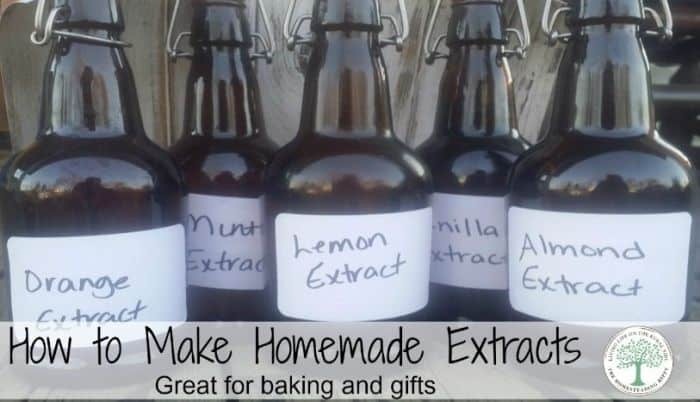 If you don’t use a lot of the extract, consider making it in smaller quantities or plan on giving some as gifts. 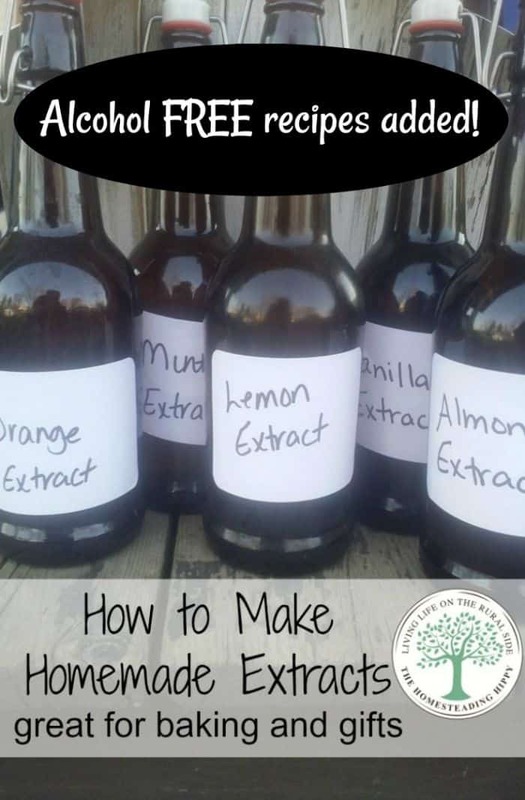 Do you make your own homemade extracts? Do you like alcohol or alcohol free versions best? Looks like I’m going to need to get some cheap vodka… Haha. I’ve never ventured down the path of homemade extracts and now I’m wondering why not. They’re so expensive and not that good from the store. You could try to use apple cider vinegar, but the results may not be the same. I don’t drink either, but this is my “one caveat” per se. Since I use less than a teaspoon of each per recipe, I don’t personally worry. But, you gotta follow your faith, right? My advice is to replace the alcohol with apple cider vinegar and see if you like it. very true! thanks for adding that! The alcohol burns off when you cook or bake with it. I use palm oil or coconut based food grade vegetable glycerin to make my non-alcoholic extracts. It DOES take about 3 times longer to do, but it is so look good! that’s a great idea!! thanks for sharing! I’d personally steer away from palm oil. It’s questionable in terms of health but there is most certainly some serious impacts in terms of the environment. It is only used used so widely because it is cheap. Can a small amount of catnip (cat mint) be added? Wish I had this info years ago, when many friends had cats. Where I worked, there were many patches growing everywhere, and they’re self seeders, seeds the size of poppy/portulaca. I used to yank out big handfuls and divvy ’em up then freeze,until I got a chance to visit. They may be to bitter, but if you or your friends have cats, try it. The cats really loved it. They could smell it as soon as I came in the door! And applying it to a fabric is not as messy as leaves scattered about. We especially enjoyed their catnip antics. Soak those vanilla beans in cheap brandy and you’ll never use anything else. Makes the BEST ice cream, and put 1 tsp. in your evening coffee for a bit of pure heaven, especially if you use cream and sugar. Hi Heather! Just found your site today and I’ve been enjoying reading a number of your posts. I’ve been making my own vanilla extract for a few years now, but never thought of making the other flavors. Thanks for the great ideas! I will pin this to my recipes board, for sure! Hi Marge! Thanks for stopping by! I hope that I can inspire you to be more self sufficient! If there is anything you would like to see, please feel free to ask! Thanks again! I’m honestly still working on something like that. I really haven’t used maple extract before…just maple syrup. I keep Vodka in my freezer. My go to drink! I am so excited to make my own extracts!!!! Thank you. For the fruit extracts, how much zest do you need? about the amount of one piece of fruit. Hi, How would I make a coconut extract? The alcohol will burn off when cooked leaving the flavor only. Where did you get the bottles you used in the picture? I love them and how the cork stays right with the bottle so it won’t get lost or fall on the floor! I buy several sized bottles with what I call ” bail tops” from TJ Maxx. The prices range from 1.99-3.99 that’s a deal. I also get dark green colored bottles. If you have a TJ Maxx near you, check them out. They don’t always have them, so just keep checking. Sometimes I go by and hit a “goldmine” of bottles & containers. Any brew supply store would probably carry the bottles. I’m wondering if the left-over almonds could be used in some dessert. I love almond extract, but always feel like I have to be stingy with it. Now, I’ll be able to add it with abandon! Same with the vanilla. I am trying to make green apple and caramel extract. Can someone help me? Do you think a cilantro extract is an option or do you think cilantro oil is the better way to go ? and if so should I make it ( the extract) by the mint recipe? Thank you for your advice in this matter. I would personally use cilantro oil vs. extract. it is much easier to make an infused oil from cooking herbs to get the best flavor. I have been making my own vanilla extract for a few years now. I use vanilla flavored vodka instead of plain vodka. I’m going to make mint extract since I have so much mint growing this year! Do you have to use the dark bottles or would clear bottles work too? When making strawberry extract do you use the whole strawberry cut up in the vodka then strain it? I have never tried strawberry extract before. I haven’t done it t considered using freeze dried fruits. let me know how those work for you! Maybe for coconut extract you could use shredded coconut. I am going to try that one and I will try the frozen fruit or may be use fresh fruit instead cause maybe the frozen fruit may have water from being frozen. On the cooking shows they just use a mason jar but put it in a dark place though. that’s worth a try!! thanks for the idea! I can’t wait to try all these recipes. I bake a lot. Vanilla is really expensive. I can’t wait to share with all my friends ??? could you use Lemongrass to make lemon extract? or use the lemon plus the lemongrass for maybe a stronger lemon extract? Hey there! So I’m fully aware that alcohol burns off while cooking/baking, but what about for icing? I love the idea of using brandy and vanilla! I only use about 1/2 the amount called for in the recipe. For example, if the recipe calls for 1 teaspoon extract, I only use 1/2 teaspoon. The alcohol does not burn off, but it’s minimal, if that helps. What is the shelf life of these homemade recipes? I think this will be my next Christmas gift for my coworkers and some family. Also, I’m looking for some smaller size bottles. Does it matter if they are dark or clear? it’s BEST if they are in dark bottles, but I have used clear, too. Just try and store it out of direct sunlight to keep the flavor from fading faster. for alcohol, the shelf life is almost indefinite, although the flavor can fade after 12-18 months. For the glycerite versions, the shelf life would be about 6-8 months. I love this idea! How would you do coconut extract? It’s a favorite of mine! Thank you! Can you do this with fruits? I’d like to make some blackberry extract. Not sure how the fruit would hold up or if it would get rancid. Any ideas? Has anyone tried this? Thanks!!! I have never tried with fruits, but it is worth the try, right? Can you use grain alcohol? I used the almonds with the skins and it turned a Carmel color… Is that all right that I used the skinned almonds. ?? I’ve used skinned almonds before and there wasn’t a problem. Your recipes say to use 1 cup glycerine and 3 cups of water. The notes in the post say 3 parts glycerine to 1 part water. I am assuming the recipe verrsion is correct, but could you please clarify this? I love the idea of making the extracts without alcohol. I’m confused on the glycerin version – in the description info you say to use a 3-part Glycerin to 1-part water mix, but all of the recipes use 1 cup of glycerin and 3 cups of water. Is it 3-parts water to 1-part glycerin? Thanks for clarifying! Used cheapest vodka for jello shots…whole batch had to be thrown out. I d prob consider going one step up.